The finest prayer book on the market - this book contains the complete 1662 Book of Common Prayer in a generous type size, bound in goatskin leather. - Publisher The Book of Common Prayer is the old and well-loved prayer book of the Church of England, in use since the 16th century. In this revised 1662 form, it has become one of the classic texts of the English language, its prayers and expressions making English what it is today. Cambridge's new editions of the Prayer Book have been freshly typeset for the 21st century, using a modern digital typeface to give a clear printing image and greater readability. Nevertheless the format and page layout of this book follow its predecessor (originally produced in the early 20th century) page for page. The book provides the complete 1662 services, including the traditional forms of the baptism and marriage services. The print is slightly larger than in the Standard Edition and therefore easier to read. It is presented in a slipcase and contains four loose presentation pages: one each for Baptism, Confirmation and Holy Matrimony, and one for any occasion. This is the best quality binding of the Prayer Book to be found. The paper has lustrous art-gilt edges and the pages are bound with a ribbon marker in soft and supple goatskin leather. 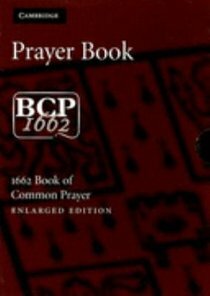 About "Book of Common Prayer Englarged Edition Brown"
The Book of Common Prayer is the old and well-loved prayer book of the Church of England, in use since the 16th century. In this revised 1662 form, it has become one of the classic texts of the English language, its prayers and expressions making English what it is today.